As our train crossed the Oder River and we noticed that signs had changed from German to Polish, our excitement and anticipation of Polish adventures were rejuvenated. It had been nearly a decade since we had been there and I was looking forward to visiting familiar places that would remind me of “back then” as well as exploring new places, new people and new foods. To be honest, I had been rather skeptical about the food. This was my fourth time visiting Poland, but my first as a vegan and I remember having trouble navigating the Polish cuisine even as a vegetarian so many years prior. 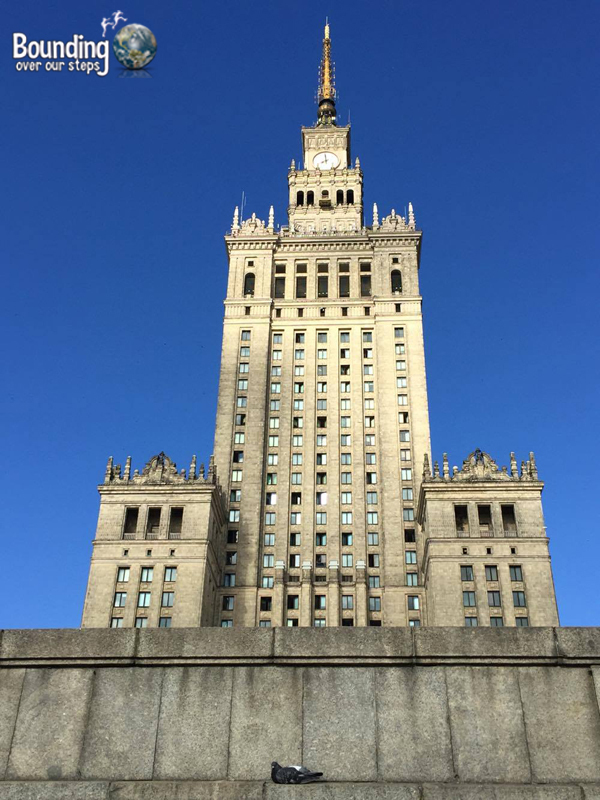 A pair of peregrine falcons live on the very top of this building in Warsaw that you can watch via webcam! Boy, were we in for a shock of a lifetime! I did my usual vegan research, which basically involves looking on HappyCow.net for any vegan or vegan-friendly restaurants, and was blown away at the number of vegan restaurants in Warsaw alone! I even had to double check to make sure that I had not pulled up Warsaw, Indiana or some such place by mistake. There were over 30 vegan restaurants listed! Not vegan-friendly…100% VEGAN! 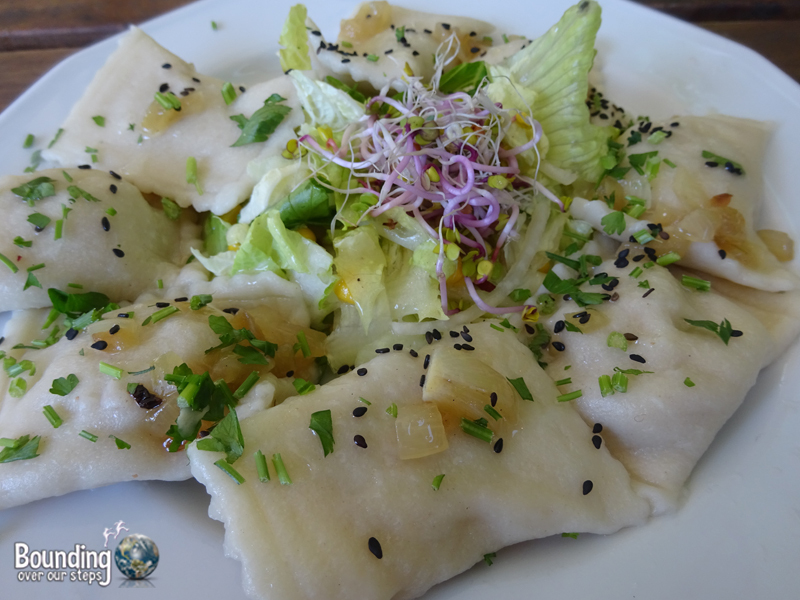 Wondering if Warsaw was a vegan oasis, we began to look up other Polish cities and towns we expected to visit during our trip and while no place offered as many as Poland’s capital, there were vegan restaurants in virtually every place in the country! It turned out that our biggest problem regarding being vegan in Poland would be trying to decide on which vegan restaurants to visit during our stay. Our surprise didn’t stop there. Everyone seemed to know what vegan means, something many people in our own countries still have trouble with. Once in Krakow, I asked an employee at a convenience store if he could read the ingredients of a Kisiel (popular dessert, especially with kids) packet to see if it was vegan. I began to explain the definition of vegan (as I always do) and he told me in a rather irritated tone that he knew exactly what it meant. Another time we were visiting the small town of Oswiecim, and after asking the waitress if the restaurant served anything vegan, she responded, “so no animals and no animal products, right?” Yes, that’s exactly right! And she went on to figure out how she could veganize certain dishes on the menu. Having so often heard phrases like, “just pick off the meat” and “just have the seafood”, we were amazed that so little explanation was required throughout Poland. A young Polish vegan described what is happening in Poland as a revolution. She told us that more and more people are learning about animal rights and are making the switch and that virtually overnight vegan restaurants have been popping up everywhere! We couldn’t have been more surprised or delighted! Our first meal had to include vegan pierogi and there were several restaurants that offered them! Again, our biggest challenge was choosing which ones to try first: the potato, the lentil, the spinach? We opted for all three! Wanting to make the most out of the kitchen in our airbnb apartment, we ventured into the local grocery stores. Would the vegan revolution extend itself to products sold in the markets? Yes, indeed! We were able to find tofu, a variety of vegan milks from the Alpro brand including soy, oat, almond, coconut and hazelnut, as well as Dark Nutters, a vegan version of Nutella. 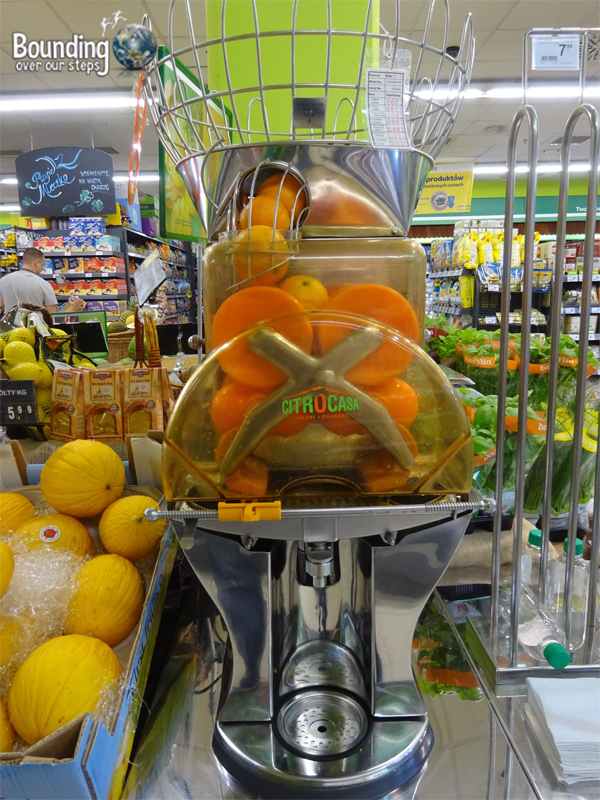 In addition, you could buy fresh pickles, fresh breads, and even make your own fresh orange juice right there in the store. 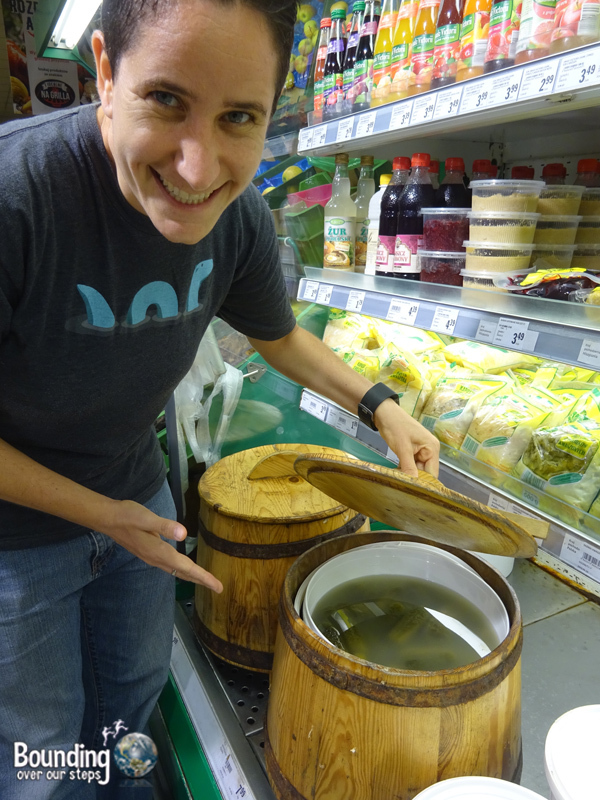 We made sure to try local Polish ingredients as much as possible so we filled up our cart with sauerkraut, fresh cabbage and celery root to name a few. 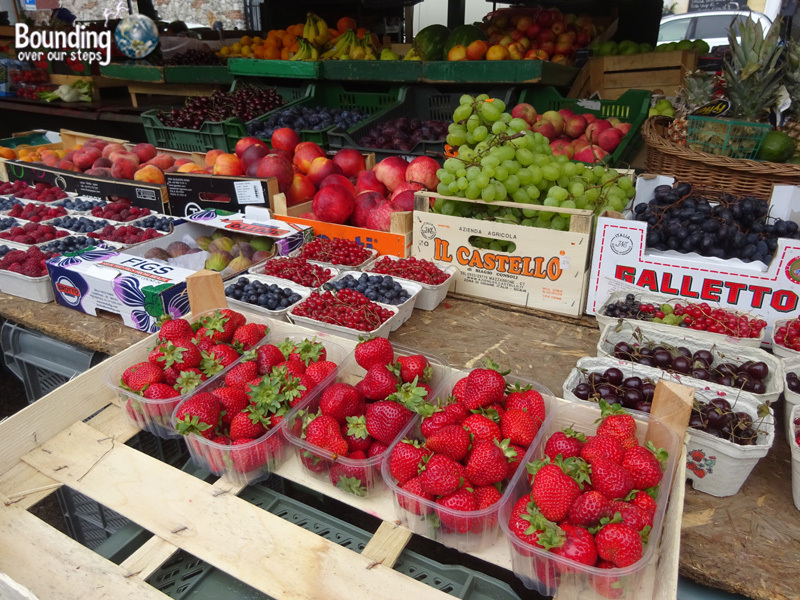 There were also fresh fruit and veggie stalls on the street sometimes (we visited Poland in the summer) where you could buy a variety of berries and other fruits as well as local vegetables. 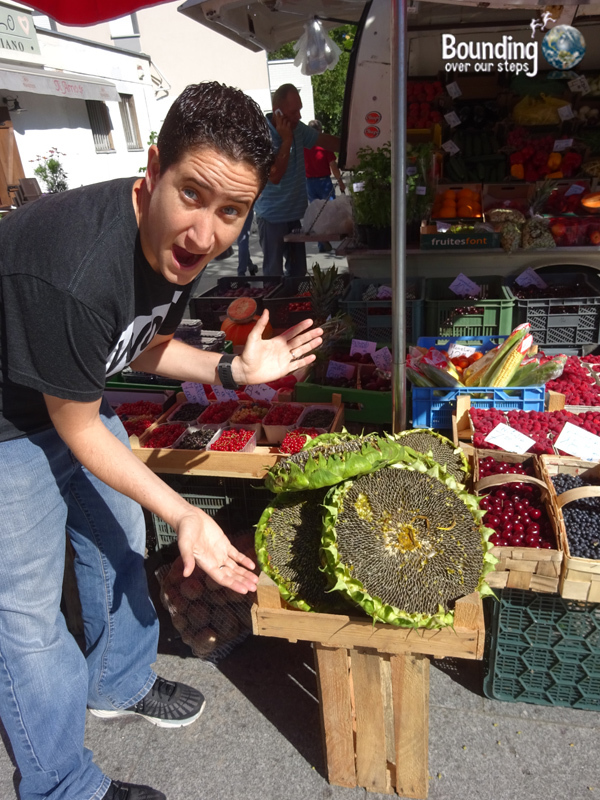 One of the neatest things we saw at such markets was sunflower seeds still in the flower! Vegemiastro, located at Al. Solidarnosci 60, serves a nice variety of freshly made dishes as well as an amazing array of desserts (be sure to save room to try at least one) and drinks, including a chia-lemonade which thoroughly refreshed me. Each time we went to this restaurant, even once with a Polish friend of ours (who loved the food by the way), we overlooked all the other amazing-sounding menu items, and always opted for the vegan pierogi. We were in Poland after all! Organitheka at Twarda 1, serves healthy vegan options, including sandwiches, soups, cold-pressed juices, salads and food bowls. Their menu changes based on what is currently in season. 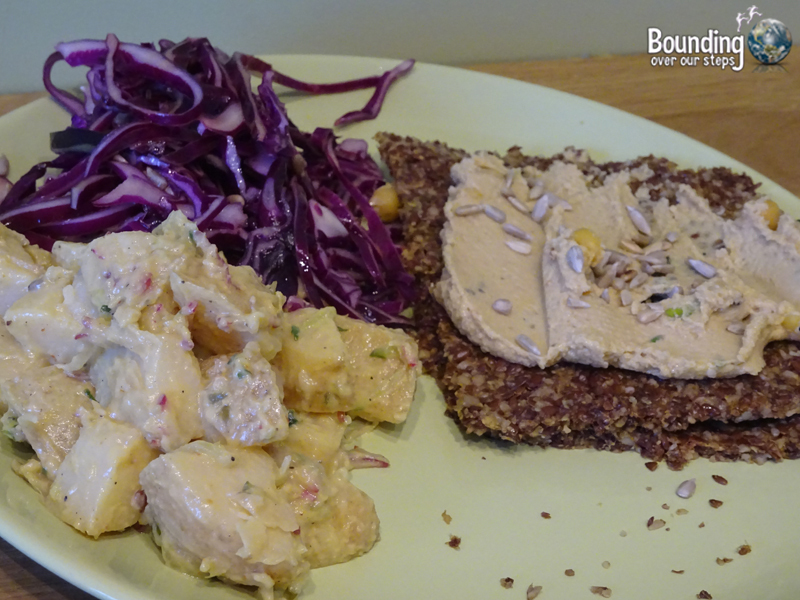 I enjoyed the sandwich which came with raw bread, a first for me, as well as potato salad and slaw made from red cabbage. This is also where we met Emilia, a waitress there, who was proud to be vegan and gave us great information about other vegan restaurants in Warsaw and even recommended that we go to her home town of Wroclaw, which we did. 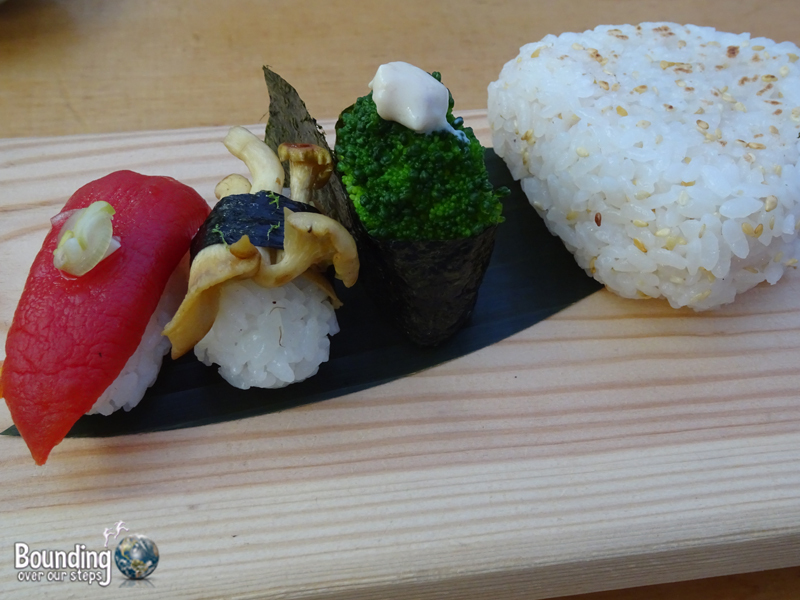 We considered ourselves very lucky to have gotten the very last table for one of Youmiko Vegan Sushi‘s biannual multi-course set menu events. They are located at Hoza 62, luckily only a short walk from where we were staying. Each of the whopping nine courses were brought to us with an explanation and an “enjoy”, which we most certainly did. We were quite frankly blown away by some of the well thought out concoctions that included a variety of deep fried ingredients, flavorful soups, sushi like we’ve never tasted, jellied items and the list goes on. What an experience! During our short stay in Lublin we enjoyed a meal at Umea, located at Orla 4. Their menu changes but is generally an assortment of delicious burgers, salads and soups. From a large chalkboard we selected the type of burger we wanted and the kind of sauce we wanted to go with it. Not only did we enjoy our meal, but we felt lucky to have the opportunity to speak with one of the owners, who is vegetarian but saw the need to open a vegan restaurant in Lublin. Nova Krova, which translates to New Cow in Polish, quickly became our favorite restaurant in Krakow, perhaps even in all of Poland. It is located at Plac Wolnica 12 in the Kazimierz district and we thankfully happened upon it while exploring the old Jewish quarter. The owner and the wait staff were vegan for the animals and when I noticed the 269 tattoo on the chef’s arm, I simply fell in love with the place. In addition to the compassion behind the restaurant, we also loved the food, which consisted of delicious burgers, incredible salads, flavorful soups and an amazing array of desserts including some very unique ice-cream flavors. We visited Nova Krova several times during our stay in Krakow and once even coincided with their lunch special that changes weekly. That week it was a beet soup, which was fantastic. We also found the burgers delicious (Mindy said this was the best burger she had in all of Poland), and my favorite dish of all was their pea salad, which was packed with flavor; we kept raving about our two dishes for the rest of the day even! And of course we couldn’t leave Krakow without sampling some of their ice-cream. We chose orange/cactus, which was fantastic and even much better than we had anticipated. We will definitely make it a point to stop by Nova Krova the next time we are in Krakow. 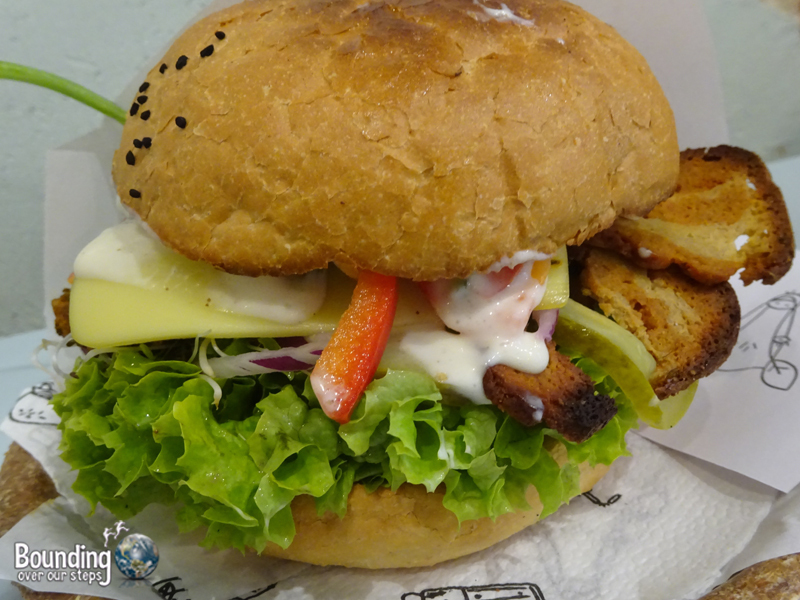 While in this southern city we also found Vegab, at Starowiślna 6, which is designed as a vegan fast food joint so they have both a small dine-in area as well as take-away. 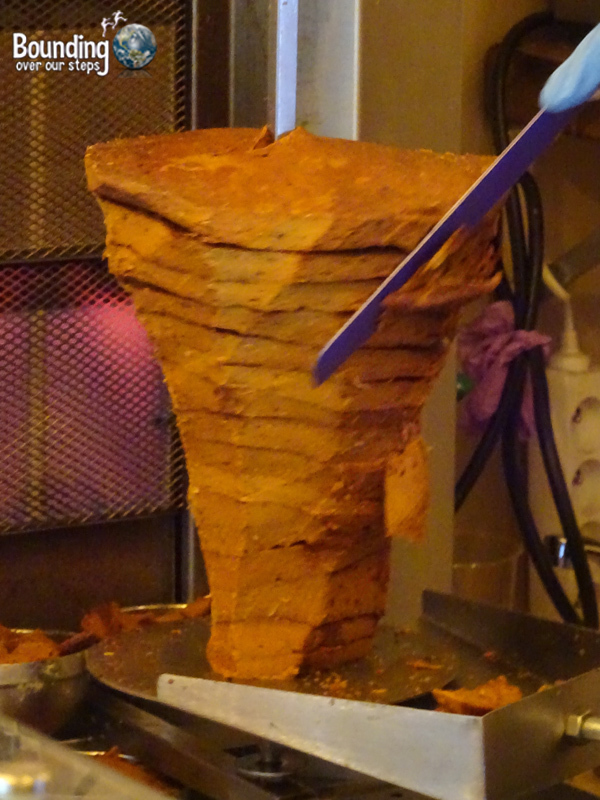 Vegab offers a few dishes but is really known for their vegan, made-in-house doner kebab, created from the perfect combination of tofu, legumes and a little bit of gluten. I tried the lasagna and Mindy opted for the doner and we both left the restaurant feeling satisfied. Krowarzywa Vegan Burger , located at Sławkowska 8, is considered by many to be the best burger place in Krakow. Who could resist that? They have a large dining area so it was easy to find a place to sit and enjoy our burgers. I got the Jaglanex, which was made of millet, pumpkin seeds, sunflower seeds, coriander and other spices and Mindy ordered the Tofex, which was smoked, marinated and grilled tofu slices. 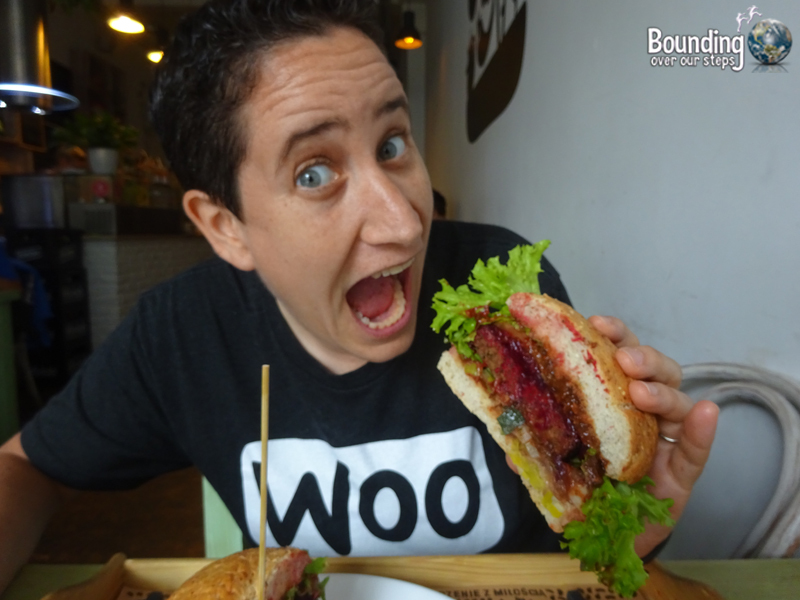 One of the aspects that we enjoyed about this burger joint was the add-ons you could choose, including vegan cheese and vegan bacon slices, both of which Mindy enjoyed on her burger. Despite the fact that this area of southern Poland is very touristy, there are currently no vegan restaurants among the numerous over-crowded eateries. 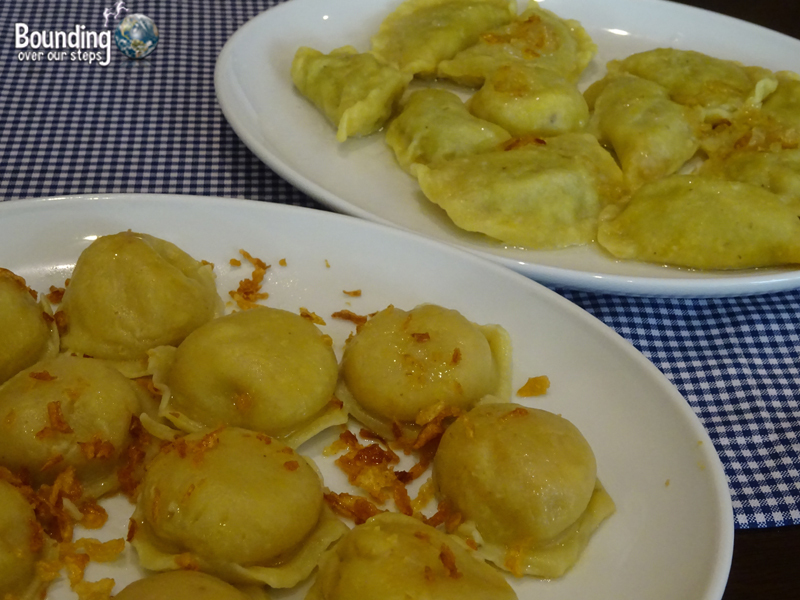 Generally, there was a huge focus on some of the local traditional very non-vegan foods, such as mutton dishes, Poledwica (pork loin) and Oscypek (salted, smoked sheep cheese). Even the traditional dessert of bombolki (yeast biscuit) is covered with honey. 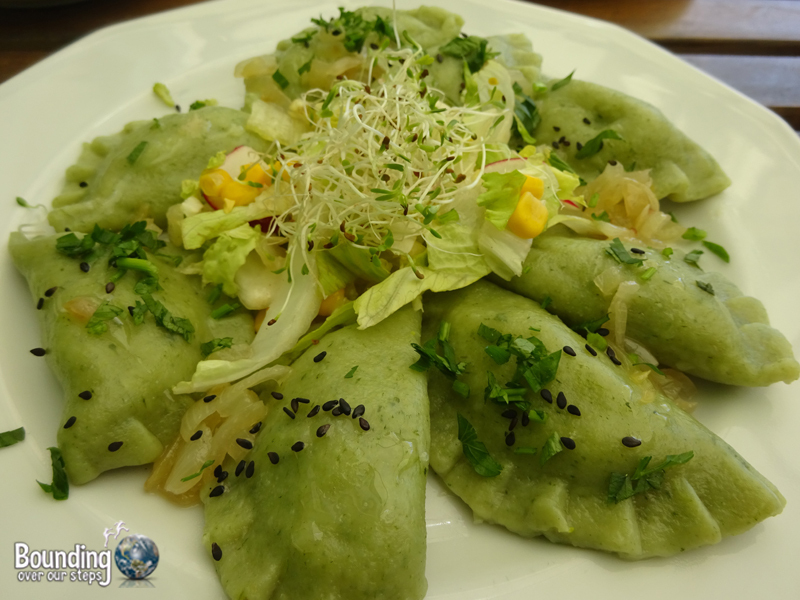 We did find, however, one restaurant which served vegan pierogi as well as several other vegan dishes: Grass, located at Weteranów Wojny 2, a very short walk from two reasonably priced parking lots. Once again we fell victim to the spell of vegan pierogi and left with full tummies. You can never have enough pierogi! While driving from Oswiecim to Wroclaw, we stopped in Katowice for a bite to eat at Zielony Most, located at Slowackiego 12. Their menu changes weekly and is beautifully written up on a giant chalkboard. There was lots to choose from and it all sounded delicious but we eventually decided on the gyros plate with roasted potatoes, two kinds of sauerkraut and tzatziki and the calzone stuffed with spinach and smoked tofu. The portions were very generous and the flavors were well composed. The owner was very friendly and was also proud that she and most of her staff were vegan. We will make sure to go to this restaurant again the next time we travel to Poland. Vega, perfectly located at Rynek 27a, almost overwhelmed us with two floors of amazing vegan choices. 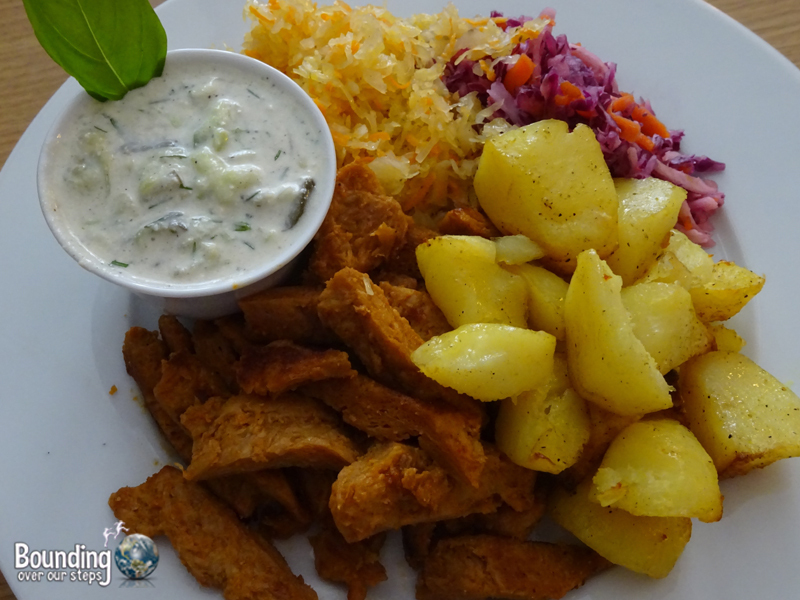 In 1987, Vega became the very first vegetarian restaurant in Poland and in 2013 they moved to a completely vegan menu and a focus on animal rights. The first floor features veganized Polish dishes and the second specializes in international cuisine. Both floors had amazing desserts. Once again we couldn’t resist the opportunity to eat potato and cheese pierogi and for dessert we ordered cheese blintzes with strawberry sauce on top and a piece of chocolate cake with coconut and apricot pieces topped with goji berries. We savored every bite! After a long day and some difficulty checking into our hotel, it was very nice to come across Ahimsa, located at Świętego Antoniego 23, which serves Middle Eastern and Asian cuisines and has a full bar. I ordered the masala dosa with dal and Mindy opted for the pineapple tofu salad with pita bread and we decided to eat in their outdoor space which was right on the street making it easy to people watch. The vegan owner was very friendly and loves to travel around the world as well, always looking for new and exciting vegan meal ideas to incorporate into his menu. 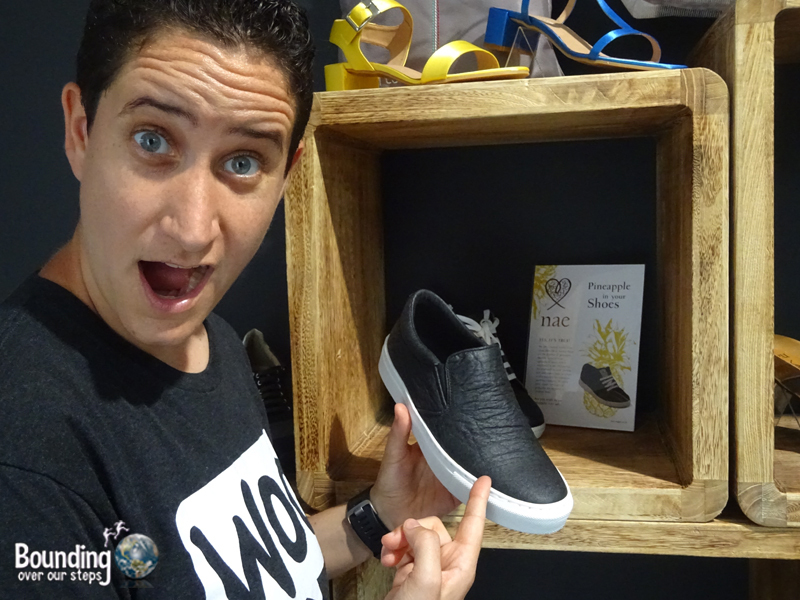 We were ecstatic about happening upon the vegan shoe and clothing store Fairma Ethical Design, which is located at Ul. Dajwór 20/LU1 in the Kazimierz district of Krakow. This new business has a large selection of cruelty-free shoes, handbags and belts as well as a small selection of T-shirts with vegan messages on them. The owner was wearing a shirt that read, “Eat plants and no one gets hurt”, and I left the store with one in my bag and wore it the very next day. She also assured me that they would soon be selling her products online and that they will ship to anywhere in the world. 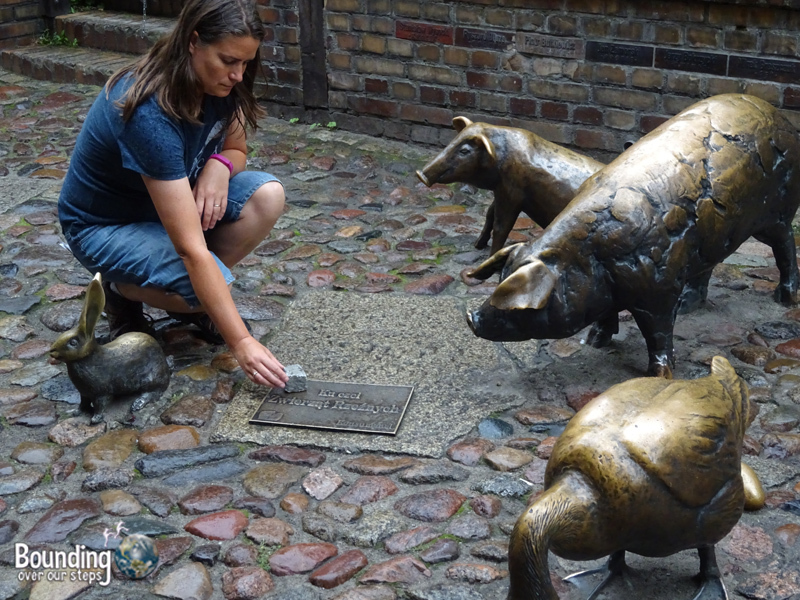 In the city of Wroclaw we were glad to come across a memorial to slaughtered animals, something that we had never seen before but feel is so needed in the world. It was created by Piotr Wieczorek in the 1990s and the sculptures, that were surprisingly funded by the government, stand on the grounds of a former slaughterhouse from the Medieval era. Unfortunately, most people who came by did not seem to take it seriously, getting pictures of riding various animals and laughing about it. We even overheard a tour guide, after explaining that this was meant as an apology to the billions of slaughtered animals, say, “Sorry that animals taste so good”. Still, it was very meaningful for us to be in the presence of such a memorial. Perhaps one day the rest of the world will get on board as well. Does Poland sound like a place you’d like to visit? Hi, loved this article! I was in Poland as a vegetarian 16 years ago and actually didn’t have trouble in Warsaw and Krakow but what I did find difficult was communicating in English, even at major attractions. How is it now? Thanks! Holy moly, who would’ve thought?! Poland sounds AMAZING. So incredible to see the slaughtered animal memorial. Hi Kelly, Poland really was amazing and I highly recommend visiting! We too were pleasantly surprised about the memorial. Maybe one day there will be more memorials like this and slaughterhouses will be a thing only of the past. Ah! I just got back from Vegab and omg, it was amazing! Thanks for the recommendation. Will be trying some of the others out over the next few days. Hi, I will visit Pisz for work. Any suggestions? Lokal Vegan Bistro (Krucza st.), traditional Polish meals in vegan versions, Polish craft beers, very friendly stuff, they work as a cooperative. Think Love Juices (Francuska st., Saska Kepa district, near the National Stadium), nice “casual dining” vegan restaurant located in a charming pre-war neighbourhood. The street is packed with restaurants, bars and cafes so if you’d like you can have some drinks somewhere else later or enjoy vegan ice cream at Akwarium (Francuska Street as well). Thank you for the great article, we are happy that you enjoyed Poland so much 🙂 All the best in 2017!! I cried when I saw the memorial, how beautiful, we need those in every city. Hi Loren, we completely agree. I have a feeling that in the future there will be more of these. The world is changing. What an amazing and in depth article about vegan food choices in of all places Poland. I never would have thought about that country as being vegan friendly and thanks to you I now know better. Thanks for enlightening me. I will tell others about your great site and Poland’s offerings. Great recommendations! I was in Poland few weeks ago and I was pleasantly surprised with how vegan-friendly many restaurants and bars there are, especially in bigger cities. For the most of my trip I have stayed in Warsaw, and I have been there in many places, vegan and not, and many of them were really amazing. The one that I remember the best was a bar in the Old Town called Bubbles Bar & Restaurant. I have gone there with my friends for a few drinks and lunch and I had the best meal there – a tomato tartar. It was so delicious and the flavor was very uniqe, unlike anything that I have had before! Wow, love what you do girls and love that food. I´m from Spain, one of the worst countries to be a not-human animal. Here also we are more and more vegans day by day, but lot of work to do here defending animal rights, and we are working on it every day. 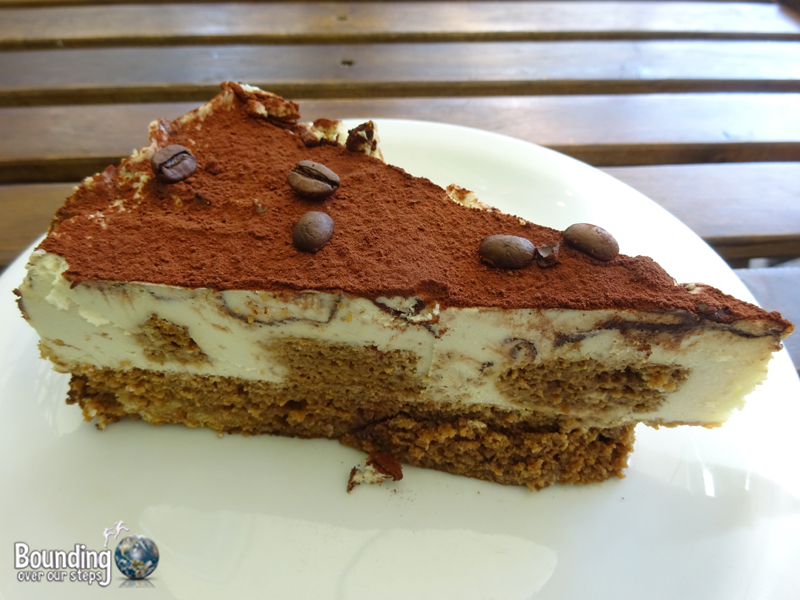 Here in Bilbao (a city in Basque Country, north of Spain), there is a vegan cake shop named Txarloska, the owners are a nice polish couple, if you come here please visit this cake shop, it´s delicious. They told me that Warsaw and Poland in general is one of the more vegan countries in Europe. Heartbreaking the last photo. Best wishes. Very good article. When I visited Poland in 2016, I was surprised how easy it was to find something vegan. It was also difficult to find vegan “Polish” food. I probably didn’t look hard enough. I am visiting Tarnow starting Monday for 10-12 days. Any suggestions?